With almost 15 million officially unemployed Americans and many million more that have simply given up, we are overdue for creative solutions rather than the same tired old rhetoric. Democrats propose more stimulus programs despite the complete failure of the original $800 million package that has seen unemployment increase by 2% since it was implemented. Republicans continue to espouse payroll tax cuts or business incentives which will do little more than exacerbate the budget deficit while enriching executive management and those that have largely escaped the distress of the most protracted period of economic stagnation in decades. At least you can’t fault them for trying, unlike our President. With an economic team that is crumbling around him, President Obama has seemed lost, resorting to rhetoric and anecdotal stories to assuage the growing discontent among the electorate. In response to the void of impactful ideas, let us examine the current unemployment insurance program and apply a little analytical rationale to the process of developing a real solution. When someone is let go, they become eligible for unemployment insurance at a weekly rate that is related to their earnings in a recent 12 month period. In California, a person can receive up to $450 in weekly benefits if their quarterly income is at least $11,674.01. While receiving benefits, the claimant must be available and searching for work. The system, however, is aligned against accepting part time or temporary work that would pay much less than one is accustomed to. Any income earned for labor services while unemployed accrue to the employee at a rate of 25% of the earnings. For someone receiving $450 per week in benefits who is accustomed to more than $970 in weekly labor income ($24.25/hr), the loss in unemployment benefits for taking a $12/hr part time job would mean that they only earn $90 incremental income per week for 30 hours of work (25% of the $360 they would earn). When you factor in the 10% of total earned income ($36) paid for Social Security, Medicare, and CA SDI (all of which are not paid on unemployment income), the incremental take home pay is $54. Factor in transportation costs and other related expenses and the person is lucky to make $1-1.50 per hour in incremental income for working those 30 hours at a reduced wage. Given the structural disincentive to accept work at a lower wage, unemployed persons are more likely to continue to search for jobs that are comparable both in income and skill as they previously possessed. Unfortunately, the U.S. economy has undergone major structural changes as a result of the credit crisis that has permanently eliminated many of these positions. The number of construction related jobs, for example, will not reach pre-2007 levels for perhaps decades to come. Despite this fact, the current unemployment insurance system creates disincentives for workers to explore other employment opportunities that may lead to long term opportunities and fill employment needs in the current environment. The additional income, taxes, and productivity that these employees would generate is lost, holding us back in our quest to emerge from the stagnation that has overcome our economy. 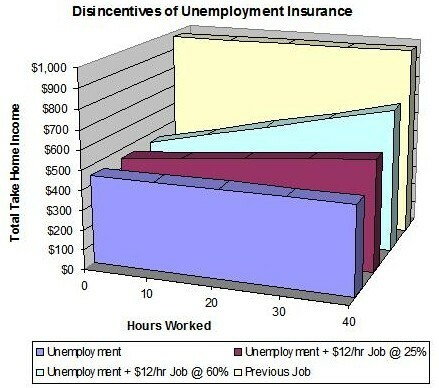 Rather than continue to extend unemployment benefits to 99 weeks (from a typical 26 weeks of benefits), the President should revise the system to encourage the unemployed to accept jobs that might not be up to their former standards, but would serve to increase their skills, contribute to our economic growth, and potentially lead to more lucrative long term opportunities. By allowing the unemployed to keep more of their earnings, you will facilitate the transition of our labor force to jobs that are being created in the current economic environment. 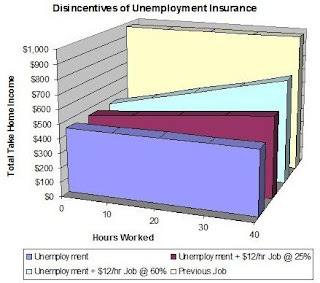 If the employee was allowed to keep 60% of their earnings while receiving an unemployment subsidy up to the weekly maximum covered by unemployment insurance ($11,674.01 quarterly = approximately $970 weekly), there would be greater incentive to get involved and pursue alternative employment opportunities. Ultimately, this would lead to lower unemployment insurance payments, greater tax revenue, and more economic activity. Such a system would encourage people to get back to work in some productive manner rather than holding out for opportunities that may no longer exist and might never return. Even part time work during a period of transition would be rewarding for both the unemployed individual and the nation. We need to stop dwelling on the failed policies of the past and start looking to the future. Only a dynamic economy that encourages exploration and personal development will be flexible enough to adapt to the challenges of a competitive global economic environment. As nature has shown, the species that fail to adapt to a changing environment are destined for extinction. I hope that our political leaders are not so myopic to allow the dominant economic superpower to wither away rather than evolve with the changing economic times.